FALLBROOK, Calif. -- One person was killed and five others injured after a small plane crashed and struck a car on the northbound 15 Freeway in San Diego County Saturday morning, the California Highway Patrol said. 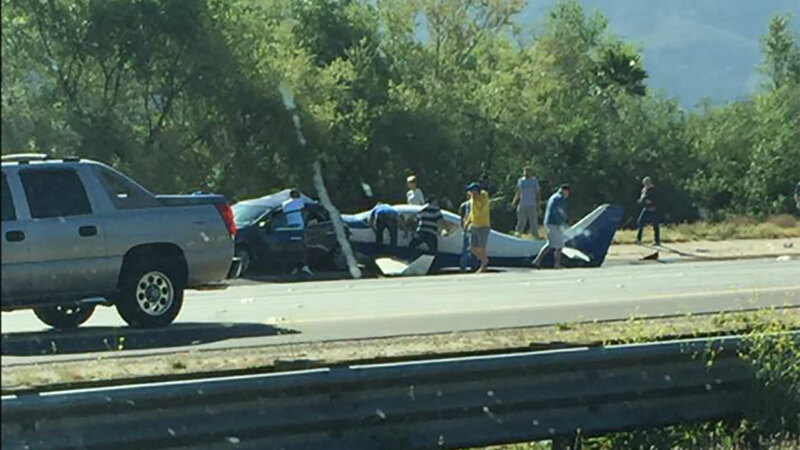 A single-engine Lancair IV struck near State Route 76 around 9 a.m., according to the San Diego Sheriff's Department and Ian Gregor of the Federal Aviation Administration. Good Samaritans rushed to pull the 62-year-old pilot and his female passenger from the wreckage. CHP Officer Tony Polizzi said a 38-year-old woman sitting in the back seat of the Nissan car was crushed to death. It took firefighters more than 20 minutes to free another woman sitting next to her from the mangled metal. The male driver of the car, as well as a male front passenger were also hurt in the crash. Authorities said the pilot suffered life-threatening injuries, including severe head trauma. The other four injured in the accident did not suffer any life-threatening injuries. Investigators say the driver of the car had stopped to sync his phone with his vehicle when the plane, which appeared to have engine trouble, headed straight toward the car. Authorities said this isn't the first time that the aircraft has landed on the 15 Freeway. The plane was previously owned by former New York Yankee Matt Nokes. In February 2000, he had to make an emergency landing after engine trouble, but officials said it was a clean landing. Neither Nokes nor the place got a scratch from the accident, authorities said.